Sara Palmieri’s eyes are anything but dimmed. Her work is full of vitality, cryptic beauty, wide-eyed wonder, marvel and mystery. The creative universe that Palmieri explores and defines through her art is one that is suggestively coherent, yet – like Einstein’s – is also remarkably dynamic, multi-faceted, infinite and ever-expanding. Initially inspired by Einstein’s theory of relativity – in which time and space are not recognized as independent of one another, but are instead fused into a four-dimensional continuum and regarded as one: ‘space-time’ – Palmieri’s La Forma del Silenzio offers a similarly complex and all-encompassing perspective, which aims to radically redefine our understanding of ourselves, as well as our experience everything around us. By drawing from and then transcending the boundaries between both art and science, it evokes that “fundamental emotion that stands at the cradle” which Einstein celebrates, and establishes a conceptual realm in which the mysterious rather than the material offers the potential of enlightenment. Furthermore, in doing so, Palmieri subtly invokes many other forms of human knowledge and fields of intellectual endeavor – mythology, philosophy, religion, psychology, poetry, metaphysics, spirituality and so on – all of which were ultimately created in search of a that same wisdom. As its title suggests, La Forma del Silenzio operates in both a symbolic and symbiotic realm, rather than a literal or binary one. It’s both a place and state of mind, where conventional understandings are questioned and transcended, where certainties fluctuate, where the immaterial can assume physical form, and where matter often disperses, dissolves or disappears altogether. Sound turns to stone; stone turns to wood; wood turns to skin; skin turns to gold; gold turns to earth; earth turns to dust; dust turns to air; air turns to light; light turns to sound; sound turns to stone…and so it continues – ad infinitum. 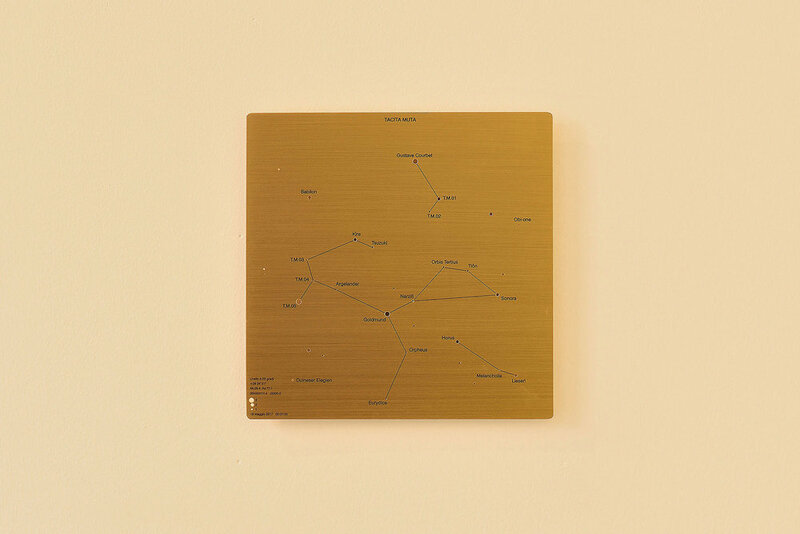 Like an ancient astronomer-scientist-philosopher-storyteller, Palmieri draws intuitive links and connections between these seemingly disparate elements, objects and images – or ‘stars’ as she often refers to them. 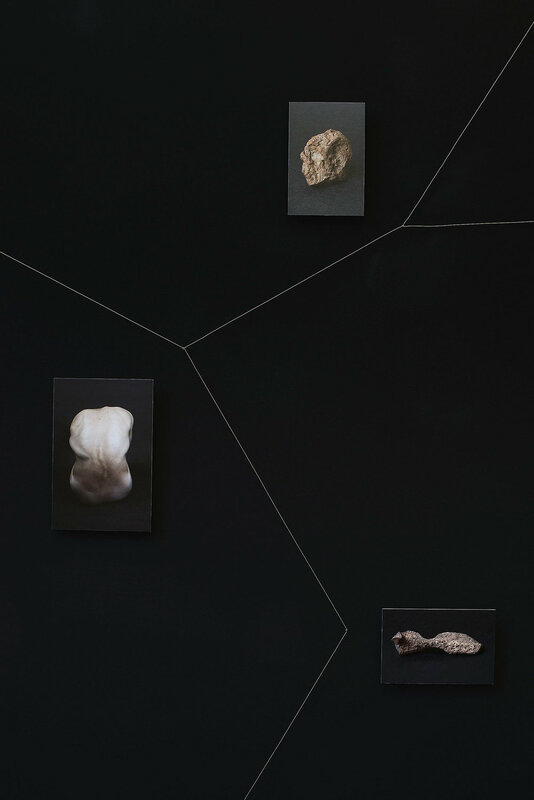 By creating deeply personal constellations out of this apparent chaos, she derives new meanings, insights and understandings from them. In doing so, she embeds herself deeply within these constellations as well, connecting with and internalizing many of the most basic, primordial aspects of the universe and their representation within her own consciousness, and thus becoming one with the universe at large. Simultaneously, she encourages us to do the same – to look beyond the physical, the visible, the material and the individual, and instead acknowledge our shared existence, fundamental interconnectedness, and the oneness of all there is – whilst at the same time recognizing that, ultimately, it all may rest within ourselves. In La Forma del Silenzio, Palmieri insists that through her externalized images we recognize, then assert, and finally rejoice in the dynamic and enlightening world within.